Stitzinger-Clark retires from the church after eight years and retires from an overall career in ministry dating back to 1990. June 11 marks the final scheduled sermon for Rev. June Stitzinger-Clark at Berlin Centenary United Methodist Church. Stitzinger-Clark retires from the church after eight years and retires from an overall career in ministry dating back to 1990. Those three words will serve as the title of the final sermon for the Rev. June Stitzinger-Clark as she prepares to stand before Berlin Centenary United Methodist Church one last time on the morning of Sunday, June 11. 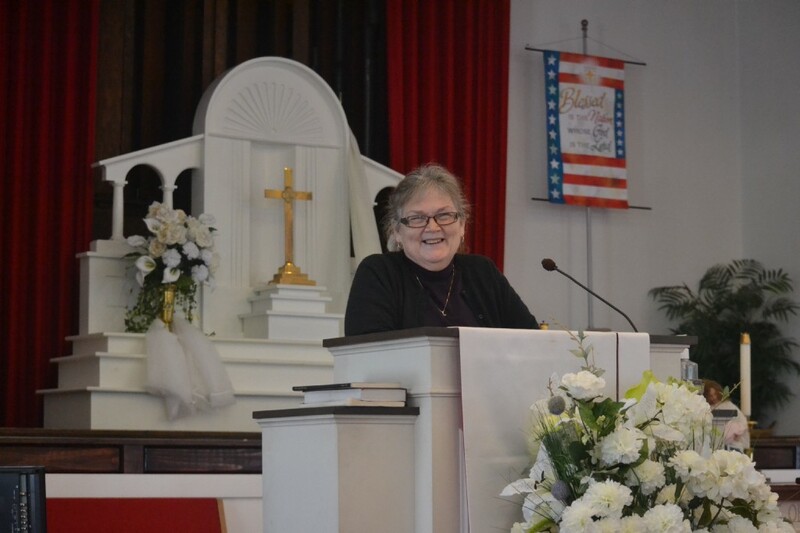 The sermon was will mark her last before her retirement from the church after eight years and her retirement from an overall career in ministry dating back to 1990. Now at age 66, with bad knees and her husband Donald seven years older and having survived five surgeries last year, almost dying three times in the process, Stitzinger-Clark said she believes God was telling her it was time to finally step back. “It was time…but I can’t speak more highly of Centenary United Methodist Church than that this has been such a blessed place to be. I truly do believe God has sent me here as a final blessing for my years of ministry,” Stitzinger-Clark said. Yet while nearly the last three decades of her life have been devoted to ministry, Stitzinger-Clark only found herself in the role starting in her late 30s. While faith was still a part of her life, she had several careers before life at the pulpit, starting when she joined the military at age 18 during the height of the Vietnam War in the late 1960s, during which time she served most of three years as an information specialist in Oklahoma at Fort Sill. She eventually found her way into social work as a teacher, counselor and program director for several non-profits, including work in the Battered Women’s Movement and helping the team that pushed for the Family Violence Prevention and Services Act of 1984, which, among other changes, made it easier for women to obtain restraining orders against abusers. Stitzinger-Clark went on to help train officers at the police academy in Camden regarding the new laws, and around that time she also began serving six years in the U.S. National Guard as a chaplain’s assistant. She ended her career in social work in the late 1980s as the director of the New Jersey Coalition For Battered Women. When her career in social work was over, Stitzinger-Clark said she decided to take some time off from work to connect with God on what to do with the rest of her life. She soon came to believe God was calling her to prayer and pastoral ministry. After meeting with her pastor and district superintendent in the Methodist Church, she began to take a few courses at seminary and was on the path she would follow for nearly 30 years. “I thought ‘OK, Lord, this is what you want me to do, and we’ll do this together,’ and so the next year I was appointed to my first church,” Stitzinger-Clark said. Stitzinger-Clark went on to serve in two churches in the Carneys Point and Deepwater area for three years as she completed her master’s degree in divinity. She was ordained deacon in the Methodist Church as part of the two-step ordination process that existed in the church at the time, and two years later she was ordained as an elder. From 1993 through 1999, she served as a pastor in Wenonah before moving on to Atlantic Highlands and Navesink across the bay from New York City. During that time, she dealt with the fallout from the 9/11 attacks, at one point serving as disaster response coordinator for the Greater New Jersey Conference of the United Methodist Church and also chairing the New Jersey Interfaith Partnership for Disaster Recovery, which distributed monies collected by different denominations and faith communities. “Certainly, you could see points of light in the midst of the tragedy of it. It was horrible, but God was there, too,” Stitzinger-Clark said. In 2004, Stitzinger-Clark moved to Lakewood, serving at a Methodist church until 2009, when she moved to her final role at Berlin Centenary United Methodist. Speaking to her time in Berlin, she said she felt blessed to be a part of so many of the great programs involving Centenary United Methodist, including God’s Interfaith Food Table food pantry, Berlin United Methodist Nursery School, providing meals and worship services to the Parkwoods Care custodial and nursing center, the church’s Prayer Shawl Ministry and more. As Stitzinger-Clark prepares for a move with her husband to Oil City, Pa., where she grew up, the now mother of four, grandmother of seven and great grandmother to one said she was looking forward to retirement. When asked to describe her final “Endings Are Beginnings” sermon, she doubted the words would be any more or less inspiring than typical, but her offer would be the same — for her and all others to leave space open in their lives for God.